Nearly thirty years have passed since Latin America began the arduous task of transitioning from military-led rule to democracy. In this time, more countries have moved toward the institutional bases of democracy than at any time in the region’s history. Nearly all countries have held free, competitive elections and most have had peaceful alternations in power between opposing political forces. Despite these advances, however, Latin American countries continue to face serious domestic and international challenges to the consolidation of stable democratic governance. The challenges range from weak political institutions, corruption, legacies of militarism, transnational crime and globalization among others. 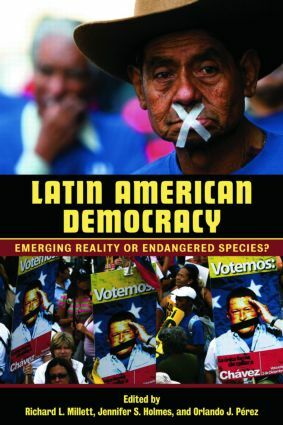 In Latin American Democracy contributors – both academics and practitioners, North Americans and Latin Americans – explore and assess the state of democratic consolidation in Latin America by focusing on the specific issues and challenges confronting democratic governance in the region. Democratic Consolidation in Latin America? Latin American Democracy: How is it Viewed From the North? ByNorth? AMBLER H. MOSS JR. The Left in Government: Deepening or Constraining Democracy in Latin America? Is Latin America Condemned by Corruption?